The flagship 2018 Bowtech Realm features a number of brand-new Bowtech technologies. See how it performed in our tests. Calling them Smartbows, Bowtech introduced the Reign Series bows late in 2017. They were an instant hit and won several awards. More recently, Bowtech has launched its 2018 flagship, the Realm, also tagged as a Smartbow. Is the flagship Realm smarter than the Reign? Bowhunters will have to decide that for themselves, but the Realm does include a number of brand-new Bowtech technologies. It almost goes without saying that the Realm features Bowtech’s Overdrive Binary Cam System, which is a double-yoked design offering a high degree of tunability. It also features Bowtech’s Powershift Technology, which allows shooters to select between a Performance (speed) setting, and a Comfort (shootability) setting. (More about this later.) The FLX-Guard cable guard system designed to reduce torque is back as well. So what’s new about the Realm? A lot, as it happens. The limbs are new, for one thing — they’re noticeably wider, which should enhance stability, and they’re solid, as opposed to laminated. It’s worth mentioning here that Bowtech bows are tested to withstand 100,000 shot cycles. Connecting the limbs to the riser is a new CP Dual Lock pocket, billed as a zero-tolerance system. The riser is less reflexed and slightly wider as well, perhaps in part to accommodate the wider limbs and limb pockets. It’s also caged top and bottom. At 30.75 inches axle to axle, it’s decidedly compact. Among the more noticeable new features is the Clutch Performance Grip, a slick, skinny grip that is all but indistinguishable from the riser. (Bowtech indicates some grip options for CPG will be available in the future.) Also new is the Orbit Dampener, which comes affixed near the bottom of the riser. It’s threaded, and it's on the side opposite where a sight or a quiver would be affixed, enabling shooters to stack weight for balance. In fact, numerous threaded holes high and low on the riser allow shooters to install dampeners, weights or other accessories to customize balance or functionality. One other new feature is really the absence of a feature: not present on the Realm is the Micro-Sync Dial, which made micro-tuning the cams for synchronization a quick and easy procedure. Finally, in terms of fit and finish, the Realm is what you’d expect from a Bowtech flagship. The test model was BlackOps, which makes obvious any irregularities or blemishes. There were none, nor were there any machining marks of any kind. 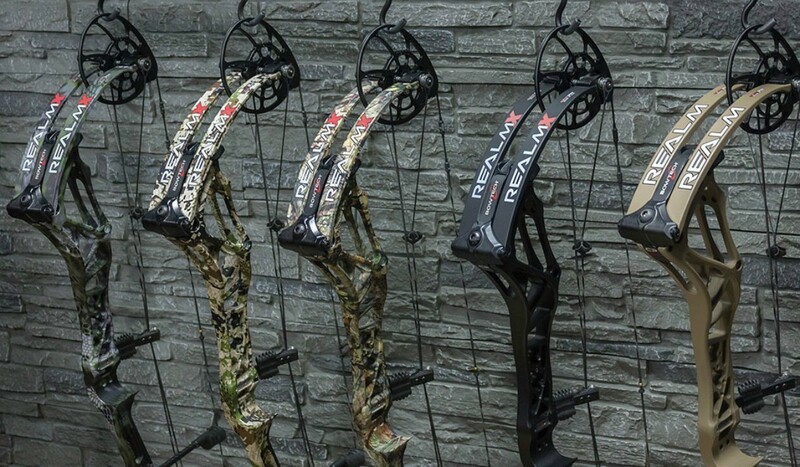 The Realm logo is somewhat oversized, but it is crisp and high-contrast, and some understated red highlights on the Bowtech logo and elsewhere popped out nicely against the black finish on the test bow. Preliminary setup proceeded smoothly. Maxed out, the test model was a little over 70 pounds, so that was brought into spec. The set screws and limb bolts turned smoothly without sticking or chattering. Lateral adjustment of the rest is as simple as ensuring that the arrow is equidistant from the front and back of the riser. Out of the box, the Flip Disc is on the Comfort setting, and I wanted to do the objective tests on the Performance setting. Making the switch is not difficult, but the screws and washers are tiny and, depending on the settings you want, cables or limbs can be in the way. You’ll want a clean, flat, well-lighted surface for this operation; it’s not something most shooters will want to do in the field. The draw cycle is smooth, and that is true on both Performance and Comfort settings. There are noticeable differences, however, apart from the speed difference, which amounts to about 8 fps. First, letoff changes, and is, as you’d expect, less at the Performance setting. This difference is made more noticeable by the change in the valley. The wide valley of the Comfort setting minimizes the difference, but on the Performance setting the valley is decidedly skinny. For shooters with excellent form who always pull through the shot, this may not be a concern. Any shooters who object to “grabby” cams will prefer the Comfort setting. The Clutch Performance Grip, as currently configured, is about as close to no grip at all as is possible. That is not a complaint; most shooting coaches will tell you that a skinny grip promotes optimum shooting form and reduces torque, and the smoothly rounded back of this grip is quite comfortable. However, shooters who prefer a wide grip won’t like this one. Bowtech has indicated that options are in development for this grip, and something wider could be among the options. At the shot — and this holds true for both Performance and Comfort settings — the Realm does produce some vibration. It does not rise to the level of hand shock or any degree of discomfort, but for purposes of comparison it’s more noticeable than with, for instance, the Reign bows. This can be minimized with stabilizers and dampening devices, or even a heavier bow sight or the attachment of a quiver. Strangely, the vibration does not translate to noise, and the Realm can fairly be described as a quiet bow. The overall design of the Realm emphasizes various options to tune and to customize the bow to personal shooting styles or preferences, as indicated by the yoked tunable cam system, the Orbit Dampener, the numerous holes tapped to accommodate weights or other accessories, and the Powershift feature. Bowtech fans — and they are many — who enjoy tuning their bows for optimal performance and accessorizing them to suit their own highly personal preferences are going to like the Realm. Each bow is carefully inspected out of the box for fit and finish and for any visible defects in workmanship. Axle-to-axle length, brace height, mass weight and draw length are measured and compared with stated specs. Minor discrepancies in draw length are corrected or noted. A QAD UltraRest is installed, and each bow is equipped with a TruGlo sight, a TruGlo stabilizer, a G5 .25-inch Metapeep and a D-loop. Test arrows are Carbon Express Maxima Red arrows at weights of 385 and 440 grains, fletched with Bohning Blazer vanes and fitted with QAD Tune-A-Nocks. Peak draw weight is established, and draw force curves, along with letoff, are determined using an Easton Bow Force Mapping System. Using a Spot-Hogg Hooter Shooter bow-shooting machine and a ProChrono chronograph, arrow speed and kinetic energy are measured at point of launch and at 20 yards. Sound is measured with an NM102 Sound Level Meter with mic positioned 3 feet in front of the bow and 18 inches under the arrow flight path. All bows are pressed on a Buckeye Archery Solutions Bow-A-Constrictor bow press.